Detached House For Sale in Hitchin for Offers in the region of £600,000. Formerly known as 'the Maiden's Head Public House, the property was granted a change of use on the 15th May 2018 from Class A4 (Drinking establishment) to use as a single storey dwelling house (Class C3 (Dwelling House). In addition permission was granted for a ground floor rear extension, demolision of modern rear extention,shed and front porch, consequential internal and extenal alterations to facilitate change of use and refurbishment of building. 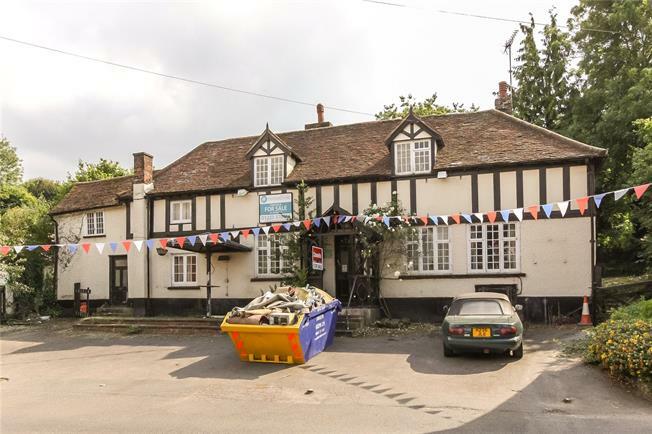 The property requires extensive refurbishment and modernisation, but is graced with many character features. The new proposed layout will include an entrance hall and cloaroom WC. There will be two comfortable receptions rooms and a open plan kitchen/diner with adjoining utility room. The guest bedroom, which is located on the ground floor, has the benefit of an en suite shower room. On the first floor the master bedroom will have the benefit of an en suite dressing room and bathroom. There will be two further double bedrooms and a family bathroom. Externally, the rear garden measures approximately 140 feet deep x 116 feet wide. To the front there is off street parking for multiple vehicles. There is also a timber barn in the rear garden,accessed via a five bar gate to the right of the building. Please contact us with any further questions or to request an information pack.